Test Assertions Guidelines Version 1.0. 23 March 2012. OASIS Committee Note 01. http://docs.oasis-open.org/tag/guidelines/v1.0/cn01/guidelines-v1.0-cn01.html. This document is a non-normative guidelines document that provides best practices in using the test assertions model defined in [TAM], as well as the test assertions XML mark-up language [TAML]. However, this document alone is sufficient for the most common test assertion design so that the reader does not need to be familiar with the above mentioned Test Assertion model and mark-up specifications. These referred specifications are only necessary for a deeper understanding of test assertion semantics or when using a formal representation of test assertions. [TAM] Test Assertions Part 1 - Test Assertions Model Version 1.0. 30 November 2011. OASIS Committee Specification 02. http://docs.oasis-open.org/tag/model/v1.0/cs02/testassertionsmodel-1.0-cs02.html. [TAML] Test Assertions Part 2 - Test Assertion Markup Language Version 1.0. 30 November 2011. OASIS Committee Specification 02. http://docs.oasis-open.org/tag/taml/v1.0/cs02/testassertionmarkuplanguage-1.0-cs02.html. [ISO/IEC Directives] ISO/IEC Directives, Part 2 Rules for the structure and drafting of International Standards, 2004, International Organization for Standardization. [RFC 2119] S. Bradner. Key words for use in RFCs to Indicate Requirement Levels. March 1997, IETF RFC 2119. http://www.ietf.org/rfc/rfc2119.txt. [CONFCLAUSE] Guidelines to Writing Conformance Clauses, September 2007, OASIS guideline. [TD] Test Development FAQ, 2005, W3C WG note . [VAR] Variability in Specifications, 2005, W3C WG note. [TMD] Test Metadata, QA Interest Group note, September 2005, W3C. 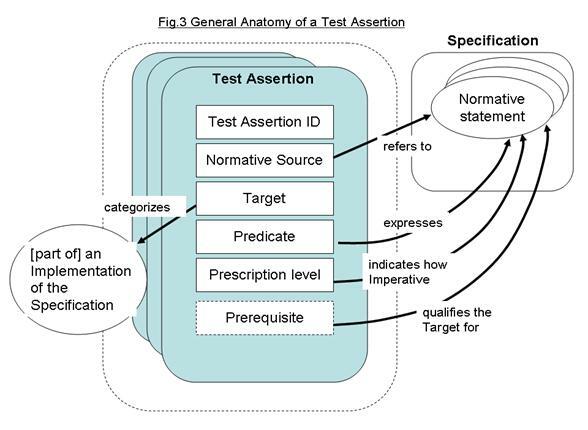 This document is a guide to test assertions and describes best practices in applying a general test assertion model defined in [[TAM]]. Its purpose is to help the reader understand what test assertions are, their benefits, and most importantly how they are created. As you will discover test assertions can be an important and useful tool in promoting the quality of specifications, test suites and implementations of specifications. You will learn that there are many ways to create test assertions. Figure 1 illustrates two ways test assertions are being developed. In the first case, test assertions are developed by specification authors concurrently with the target specification. In the second case, they are developed by another party after the specification is complete. A Test Assertion should not be confused with a Conformance Clause, nor with a Test Case. The specification will often have one or more conformance clauses [CONFCLAUSE] which define various ways to conform to a specification [[VAR]] . A set of test assertions may be associated with a conformance clause in order to define more precisely what conformance entails for a candidate implementation. Test assertions lie between the specification and any suite of tests to be conducted to determine conformance. Such a test suite is typically comprised of a set of test cases. These test cases are derived from test assertions that address the normative statements of the specification. 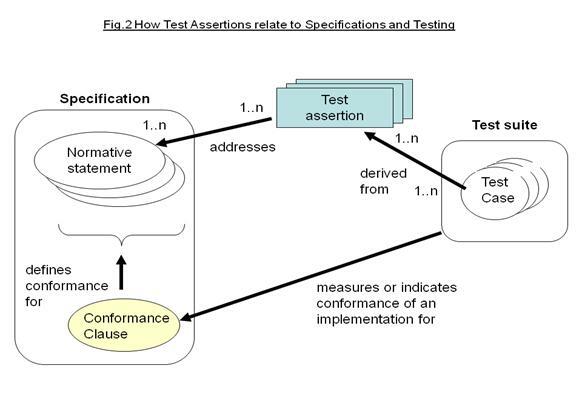 Figure 2 illustrates how test assertions relate with the concepts of test suite and of specification. This section aims to cover the simpler aspects of test assertions. Some more complex aspects are covered later in Section 4. The model used here is formally defined in the specification OASIS TAG TC Test Assertions Part 1, Test Assertions Model [[TAM]]. The specification OASIS TAG TC Test Assertions Part 1, Test Assertions Model [[TAM]] defines a formal model for test assertions. The following table shows how this model maps to parts in the representation of test assertions used in the examples. The granularity of a test assertion is a matter of judgment. A single test assertion instead of two could have been written here, with the predicate: “[the widget] uses exactly one AA battery AND has a battery holder encasing the battery”. This choice may later have an impact on the outcome of a test suite written to verify the conformance of widgets. With a single test assertion, a test case derived from this test assertion will not be expected to distinguish between the two failure cases. Using two test assertions - one for each sub-requirement - will ensure that a test suite can assess and report independently about the fulfillment of each sub-requirement. Other considerations such as the different nature of tests implied or the reuse of a test assertion in different conformance profiles [[VAR]], may also lead to the adoption of “fine-grained” instead of “coarse-grained” test assertions. Usage considerations will dictate the best choice. The predicate is worded in an abstract way, still close to the wording of the specification. No indication of what kind of test procedure will be used, such as how to determine the number and type of batteries, is given. Detailed criteria for the condition evaluation, such as what kind of battery holder is acceptable, are also not provided. These details are normally left to the test cases that can be derived from the test assertions. These test cases will determine the precise criteria for conforming to the specification. However, if a precise criterion for interpreting the battery holder requirement is provided in an external specification, either referred to directly by the widget specification or by a related conformance clause, then a test assertion should use this criterion in its predicate. Such a test assertion should then refer not only to the specification requirement in its reference property, but also to the external specification or to the conformance clause that refers to this specification. • requirement 101 uses “medium-size” as a prerequisite: its predicates only concern widgets that are already established as medium-size. • requirement 104 defines how to qualify a test assertion as medium-sized. The test assertions widget-TA104-1 and widget-TA104-2 will be used to derive test cases that verify if the property "medium-size" applies to some widget. A "false" outcome for their predicates is an indicator that the medium-size property does not apply. It is not indicative of a violation of the specification itself. Such test assertions are called in this document "Property test assertions" to distinguish them from test assertions that are used as indicators of conformance to a specification. However, both types of test assertions are designed in the same way, with a predicate that indicates whether or not a target satisfies some feature or property. There is no mention of the “medium-size” property in the predicates of test assertions ‘widget-TA104-1’ and ‘widget-TA104-2’. This is because this property is precisely what needs to be established by a test suite containing test cases that are derived from these test assertions. Only when a target (here a widget) evaluates to “true” for these two test assertions, will it be considered medium-size. These test assertions are only concerned with the nature of these tests, not with how to interpret their outcome. In the previously mentioned cases, it is often useful or necessary to "derive" a new textual statement that will be the actual normative source for the test assertion, and for which the predicate outcome will unequivocally indicate fulfillment or violation. This leads to the use of the DerivedSourceItem element of the "normativeSource" class in the Test Assertions Model [[TAM]]. This derived statement may in turn be worded so that the Predicate is implicit (see 3.2.2). In the case of "multiple statements", although using several references is possible in the Normative Source element, it is recommended to derive a new consolidated statement. Identifying the normative source subject to a test assertion may be a delicate exercise, as the source material is often dependent on its context for its meaning. A more complete, self-sufficient statement may be then necessary to clarify the normative source and how it should be interpreted when testing. This may be done using the Interpretation element of the "normativeSource" class in the Test Assertions Model [[TAM]]. A list of test assertions related to either conformance or interoperability testing will need special care with respect to version control and change management. Therefore, the criteria used to determine which test assertions are members of the list and which are not must be clear. The special case of a container for all test assertions related to a given specification or profile is a special example of an explicit list, although here the method used to define such a list may involve the use of inclusion of the test assertion itself rather than just its identifier within a special document or package. One way to create such a list is to include all such related test assertions within a document, called a 'Test Assertion Document'. Other synonymous terms might be 'Test Assertion List', 'Specification Analysis', 'Test Assertion Collection' or 'Test Assertion Set'. Note that the container of this complete set of test assertions might instead be the document of the specification or conformance profile [[VAR]] itself, when test assertions are included within the text of the actual specification or profile. © Make the remaining, required portions of the referenced specification optional. · strengthening the meaning of an assertion with additional requirements, eg. IF (x) THEN (z) => IF (x AND y) THEN (z). • tag: VersionAdd: the lowest numerical version to which the test assertion applies. • tag: VersionDrop: the lowest numerical version number to which the test assertion does NOT apply. The examples of test assertions up until this point have been represented as labeled values. An alternative is to use 'markup' with the eXtensible Markup Language (XML). One form of markup for test assertions using XML is the OASIS TAG TC Test Assertion Markup Language [[TAML]]. This might represent the above test assertions as follows. The test assertion defines a normative statement which may be mandatory (MUST / REQUIRED / SHALL), permitted (MAY / CAN) or preferred (SHOULD / RECOMMENDED). This property can be termed the test assertion’s prescription level. NOTE: in the case of the normative source including keywords 'MUST NOT' the prescription level 'mandatory' is used and the 'NOT' included in the predicate. There are differences between various conventions of normative language [[ISO/IEC Directives]][[RFC 2119]] and the above terms may be extended with more specialized terms for a particular convention and its distinct shades of meaning. Candidate draft for Public Review and CN. -Removed some statements that could be construed as normative, added clearer references to the TA model specification.